Planning an Exterior Painting Project in 5 Easy Steps - GNH Lumber Co. Planning an Exterior Painting Project in 5 Easy Steps - GNH Lumber Co.
Before you visit GNH Lumber to choose paints, you will need to select a color palette for your home’s exterior walls, trim, shutters and doors. There are some tried and true color combinations that produce a handsome result, so you can take the guesswork out of color choice. You can use Benjamin Moore’s “Color Viewer Tool” to help visualize the end result, and even list compatible paint colors by name and product number for easy reference. Tip: If you’re painting your home’s exterior for resale, it’s best not to opt for unusual or intense colors, like flamingo pink or bright orange. Basic whites, light blues, light beiges and yellows work best for curb appeal. A clean and debris-free exterior is best for holding paint, so before you apply a single coat, spend a day preparing your home’s exterior. The first step is sanding or scraping old and peeling paint with this helpful 5-in-1 Painting Tool, available at GNH. (You can also use this tool to patch up holes in walls, siding and shutters with Spackle, putty or wood filler). Next, check for gaps between siding and windows, and caulk where needed, or replace lengths of siding or shingles. Finally, use a power-spray to thoroughly wash your home’s exterior and allow a couple of days to dry completely before applying a primer coat. Tip: Paint has trouble sticking to anything but smooth, clean surfaces! Rotten wood or siding won’t hold paint well, so it’s best to replace with new before painting. Watch your weather forecast carefully, and choose a stretch of warm, dry days to execute the painting project! Weather is critical, because paint needs proper humidity and temperature to dry properly. Plan on having a couple of days (a weekend) to work. After freeing up the time in your calendar, you can now prepare to paint! Make sure you purchase more than enough paint to cover your home’s exterior, siding, shutters, doors – and get a little bit more than you think you will need for touch-ups. Tip: Place plastic tarps or drop cloths over walkways, shrubs and grasses to help protect against spilled paint. Move or cover up any outdoor furniture, hoses, grills, etc. The rule of thumb has always been to apply a good coat of primer, sand, then apply your color coats. This is still a good rule to follow and Benjamin Moore primer is on sale this month at GNH! That said, new paint technologies have combined primer and paint into one product, which manufacturers assert will cut down on the number of coats you will have to apply. 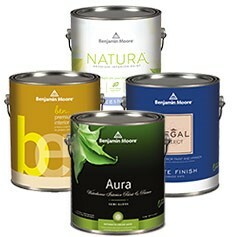 This newer paint is more expensive, but may be comparable to the purchase of separate primer and paint. Tip: Start at the top and paint down to control streaks and drips. Drips are inevitable, but this method will allow you to feather out mishaps in the direction you are working. Happy painting! With a little planning, your home exterior painting project can be fun and satisfying, and the result will be beautiful. 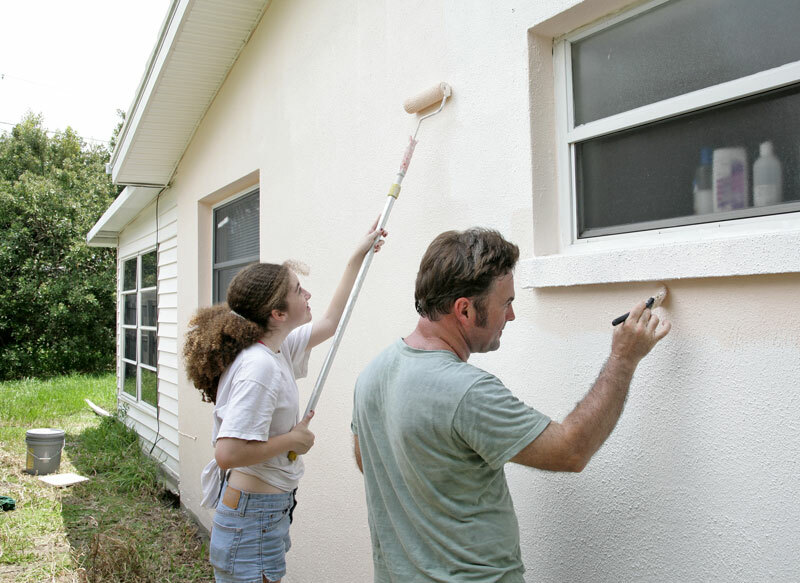 Adding a fresh coat of paint both protects the exterior surfaces of your home and improves its value. Questions? Ask us! At GNH Lumber, we have everything you need to paint your home, inside or out. 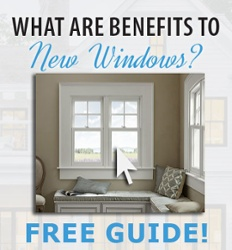 For more guidance, tips and ideas, stop in to our Greenville or Windham locations, or visit us today online!